Your vision of outdoor living can be fulfilled in a creative and cost effective way. 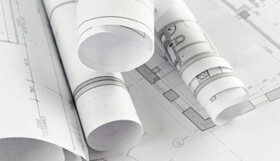 We specialize in custom designs and work step-by-step with you or your architect to implement virtually any set of plans. You may ask us to visit your residence to assess the property and gain a greater understanding of your ideas. This helps to assist you in creating a design that will compliment your architecture and landscaping. We will take on any job, large or small, using concepts and skills developed over 40 years in the business. Our work has been featured in Better Homes and Gardens, Sunset Magazine, Home by Design and The Seattle Times. From start to finish, our artisans, designers and project managers oversee each installation to make sure that you receive precisely the design and quality of work you have envisioned. Excavation and prepation of the site plus the installation of a weed barrier. Pave part of the site with bricks and cover the rest with variegated gravel. Install a 35 ft long brick step along the front entrance.